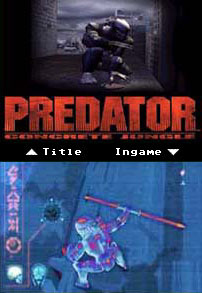 There has always been an interest in the Predator (and Alien) character, as these many and varied games platforms demonstrate. Sadly most of the movie-license games of the era were poor, mainly because the developers spent most of their budget on the license leaving very little to actually spend on the game itself. 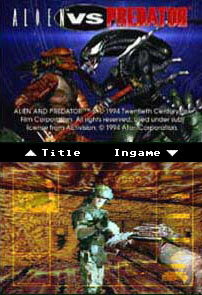 Later games took advantage of the 3rd person genre, placing the player directly inside the Predator (and/or Alien) universe. Other variants include the real-time stategy genre in the style of Command and Conquer. 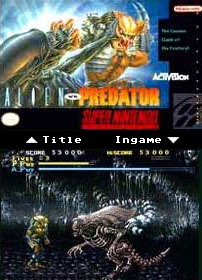 And of course, apart from Predator-only games, there have also been many stand-alone Alien related games... but this page documents only Predator and Alien Vs Predator related games. The game is very simple - everything that moves wants a piece of you. Sometimes the Predator tries to hunt you with his famous laser-sights and you have to avoid it, but sadly there's nothing to it more than going around and killing other soldiers. Finding the alternative weaponry helps, and the trick at the end of the game is a nice touch (provided you don't have the 'Fast' version, which is bugged and unbeatable). 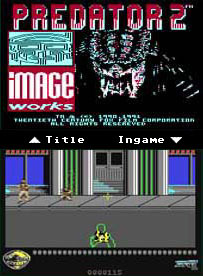 The game features relatively good graphics, with a well-animated Arnie sprite, and versatile backgrounds. The music is pretty good, but the FX are nothing special. Unfortunately many movie-license games of the era were poor, mainly because the developers blew most of their budget on the license and then cut corners to get the game out of the door. There's actually two (or more) versions of the C64 game: the "Fast" version and the "Slow" version. In the slow version you can use additional items with F1-F7 keys, and in the fast version you'll be trying to complete it forever in vain. But for the slow version, this is the way it's done. To start with, forget about even your bow and arrow explosives (there's a little bush you must crouch at towards the end to pick them up), they may have worked earlier in the game but they're useless now. On the final screen, you'll notice two vertical stripes going up the back ground effectively separating the screen into "thirds". Look carefully and you should notice at least one going up from the log. Drop the bow, then position Arnie on the left side of the left-most rope, with hands roughly on the same level as the bottom of the rope. 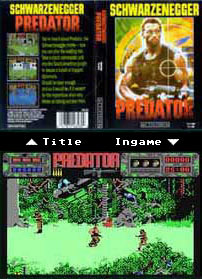 Pull down on joystick to lift the log, then pick up the bow and shoot the Predator until he goes off the right edge. Then quickly put down the bow again and when the Predator is under the log, pull down again. Bam! After this, you can run off the right edge of screen. Though, you may get no special end-sequence, just a "game over". You can also pick up the radio in level three, but it's not known if that makes any difference. Funnily enough, early Amiga game conversions were usually of similar quality to the Commodore 64 versions, only with 16-bit graphics and audio. This was no doubt because the Amiga was still in its infancy, while the Commodore 64 had already been around for many years. The actual gameplay of the Amiga version was almost identical to the C64, but the obvious difference was much more colourful and detailed graphics and animation. Also much improved was the sound, with atmospheric title music (nothing like the Predator soundtrack though, sadly) with genuine audio samples used for the gunfire and jungle sound effects. To restore your energy to full, press F10 (unverified). Welcome to the jungle, Dutch. You arrive with only the clothes on your back. You see tree-covered ledges ahead of you, mostly blocked by piles of rock or cut by bottomless chasms. You need to jump from ledge to ledge to find weapons, and to find the cave that will lead you to the next stage. Until you find a machinegun, a laser rifle, or a grenade, all you have are your fists. Your first job is to find a weapon fast. Meanwhile, you must dodge or destroy guerillas before they destroy you. Watch out for scorpions. One touch from them and you lose a life point. There are other creatures including moving boulders. If anything moves, get out of the way, jump over it, or shoot it. You can duck and shoot at the same time, a good way to waste scorpions. But you can't duck and punch at the same time. Dutch has ten life points. Any time he is shot by a guerilla, or touched by a scorpion, he loses a life point. These appear as white boxes in a row along the top of the screen. 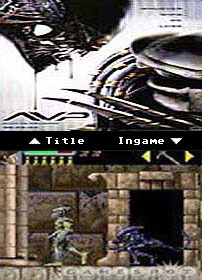 The number of lives he has left also appears at the top of the screen along with the weapon he is carrying. When he loses all ten points, he dies, losing one of his lives. Falling in a chasm is instant death. If he loses all lives, the game is over. You star as Lieutenant Mike Harrigan, an L.A. Cop caught up in the city's worst nightmare! An alien species has come to town and he's got some carnage to reign. It's up to YOU to stop him! 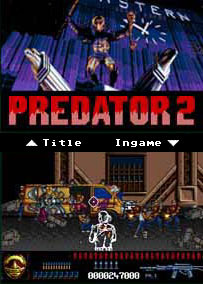 A different type of game than the original, Predator 2 opted for the 'Operation Wolf' style gameplay, with the lead character (Harrigan) a see-through object so aiming wouldn't be impaired. There are weapon powerups to be had and innocent civilians to be saved. Unforunately the game suffers a similar problem as the original, being based on a movie license - it's exactly what it looks like, thrown together in an attempt to cash in on the popularity of the flick. The basic premise of this game is that you have to must survive four levels of scrolling shoot-em-up. Fire at weapon and ammo icons to collect them, but try not to hit bystanders. Shoot bad guys and incoming bombs, grenades, and knives. The controls take just a little time to get used to, and the manual recommends using a mouse (which seems best), but you have to get used to the way your crosshairs whiz around the screen. Eventually, though, you do, and you're taking out bad guys right and left. Despite misgivings about non-hard disk installability, disk loads are relatively fast and intros can be skipped by with the fire button (although you should watch the intro at least once, it features sound effects from the movie and nice Predator-vision graphics.) In-game graphics are good... you can even see a hint of the Predator in the level one as a distortion flickers by, or his 3-beam laser guidance focuses in on a bad guy. If you're unfortunate enough to actually hit the Predator while he's cloaked, he responds in kind with one shot at you. He eventually comes out to kill you in the final scenes - unless you can take him out first! Start the game, press 'P' to pause and type "YOU'RE ONE UGLY MOTHER". You must hit space between each word but the apostrophe is optional, the cheat will work whether you type it or not. The border should flash for a little while and you will now be invincible and can skip levels by pressing '1' on the main keyboard. You are the Predator! You're the last of a Clan that's been decimated by an overwhelming number of savage aliens. Their numbers and ferocity can only mean one thing - they're defending an Alien Queen! Defend your honor! Defend your clan's honor! Hunt the Queen and take revenge. Use your awesome Predator weaponry: laser cannors, wristblades, cutting disk, bombs and cloaking device as you fight your way through hordes of vicious Alien warriors, face-huggers and chest-bursters on 7 maze-like levels in your quest for the ultimate trophy - the Alien Queen! 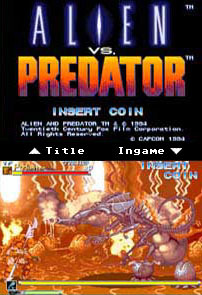 Based on the arcade game, Alien vs. 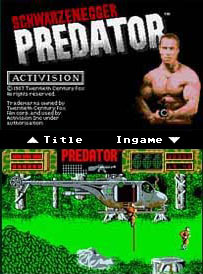 Predator is a fun, though run-of-the-mill side-scroller from Activision. Taking the role of the Predators, you must destroy Aliens that are inhabiting Earth as you hunt them down through city sewers, streets, and buildings that contain the deadly creatures and their queens. Both the Aliens and the Predators are well-animated and easily identifiable, and the music and sound effects are suitably creepy (if not overly-repetitive). Boss levels could use a dose of adrenaline, while a two-player mode and the ability to play as the Alien would have boosted replay value. 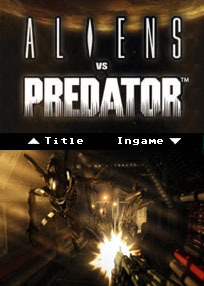 All in all, like the Predators in the game, Alien vs. Predator blends into the genre's background when it should be leading the pack. This first-person game is a highlight of the 64-bit Atari Jaguar system. The player can play as a Colonial Marine who must eradicate his infested base and escape alive. 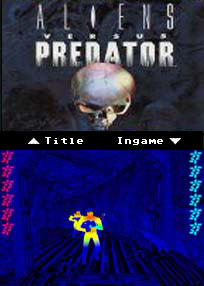 He can also choose to play as the Predator and try to acquire the skull of the Queen Alien. Lastly, the player can be an Alien who must cocoon Colonial Marines, fight Predators, and strive to free the Queen Alien. Each character has its own items and characteristics. 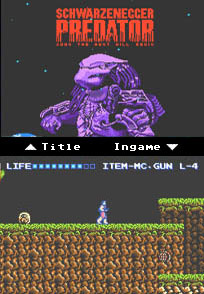 This game was the first of the 1st person alien and predator shooters. you could choose to be an alien, marine or predator and you shot, hacked or decapitated your way to the exit. As the alien, you could impregnate people and that would be where you returned when you died. As the marine you simply shot stuff, and as the Predator your game was based on an honour system, with more points being awarded for ki'cti pa usage and so on. Apparently this was a great game - but because the system was a flop, the game also suffered a terrible fate. View quick Alien ending: Press Pause, Option, 6, 1 + 3, then release those buttons. Then, press B, A, 9, A, 9, A, *, Option, 6, #, *, *, Option, 2, Option. The Predator will laugh to confirm correct code entry. Then, create a cocoon and allow the alien to be killed after it matures. Press Option + A or Option + B as the cocoon is hatching to view the ending. The battle royale between two classic action movie bad guys spilled over onto arcade screens in 1994's Alien Vs. Predator, spreading Final Fight-like mayhem everywhere. A pair of Predators joined human Marines Major Dutch Schaefer and Lieutenant Linn Kurosawa on a quest to rid our planet of those long-headed, acid-spewing monsters from the Alien movies. Up to three players could share the screen on Alien Vs. Predator, teaming up against the numberless Aliens that tried to destroy them. Like most side-scrolling fighting games, this one featured old-fashioned brawling, along with a smattering of special moves. 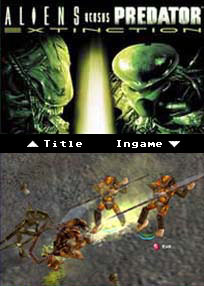 But in addition to the traditional 'attack' and 'jump/charge' buttons, Alien Vs. Predator also gave its combatants auxiliary weapons, allowing them to blast away at the oncoming hordes. Fox has announced Fox Arcade: Sci-Fi Pinball for Windows and Mac. The title will include four tables based on Buffy The Vampire Slayer, Aliens, Predator and The Fly - a bonus vintage Fly table will also be available for play. "We've leveraged Fox's top sci-fi brands, with their huge built-in audience, and combined them with the incredibly popular pinball genre to create a fun, affordable game," said Fox boss Jon Richmond. "Targeted to sci-fi buffs and pinball fans, Fox Arcade: Sci-Fi Pinball should be a hit among gamers as well as general consumers." Blurb for The Predator table: "Track down the Predator in the jungle and the city! Collect human and alien skulls for bonus points!" Chase, stalk, and annihilate in over 50 levels of the most nightmarish, chillingly detailed futuristic environment your mind could never imagine. Now the three most ferocious species in the universe are pitted against one another in a bloodthirsty battle for the ultimate prize - survival. 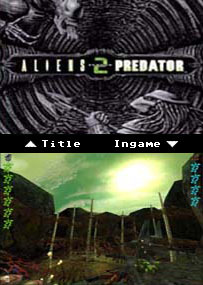 Aliens Versus Predator 2, sequel to one of the most frightening games ever made, takes you to Planet LV1201, where three of the most dangerous and bloodthirsty species in the galaxy battle for survival. The story-driven plot weaves together the fates of all three species. 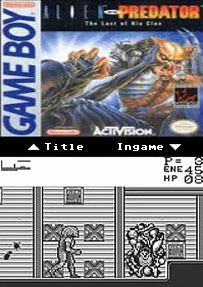 The action is as intense as the blockbuster films on which the game is based. Choose to play as Alien, Predator, or Marine, and use your physical prowess, killer instincts, or superior firepower to stay alive. During gameplay, press Enter and type '<cheat> X', replacing X with any of the following codes. 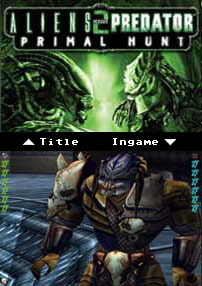 Aliens Versus Predator 2: Primal Hunt Expansion Pack combines creatures, weaponry, and settings from Aliens Versus Predator 2 with three all-new interlocking, character driven stories of a corporate mercenary Predator and hybrid PredAlien. This time the PredAlien and Predator stories begin to unfold 500 years before the events of Aliens Versus Predator 2. With new weapons and challenges, the three enemies battle over a mysterious artifact with the power to keep the savage Aliens at bay, and as legend has it, even control their minds. During gameplay, press Enter then type the following codes. On a cold, distant planet, the war against extinction is on and your command skills will determine its outcome. Control an Alien hive, direct a Predator clan, or lead an elite squad of Colonial Marines and fight for the survival of your race. Experience the Aliens versus Predator universe from the perspective of the Aliens, the Predators, or the Colonial Marines in 7 unique missions customized for each race. Control never-before-seen Aliens, Predators, or Marines and upgrade your weapons and abilities to gain a tactical advantage. Do you have what it takes to win this ultimate battle of the species? Cheat Win, Clear Fog of War, Enable All Levels, Gimme $10000, Player Invulnerable, Show LZs, Toggle Unit Spying. The year is 2000. The Predator race has been observing humans for centuries, waiting for us to hone our war skills enough to be suitable prey. Well, thanks to our amazing gift for inventing new and more depraved ways to kill each other, the Predators have decided that time is now. Slip behind the helmet of a high-ranking Predator, an esteemed hunter looked up to by his brethren. This original story ties into the Predator film and comic mythologies (with the back story to the Weyland-Yutani empire) and all movie-based weapons and tools, including cloaking device, wristblades, the plasmacaster and the smart disc. Avoid traps as you progress through the game, including powerful Sentry Guns, and collect trophies from your prey. Alien vs. Predator gives you front-row seats to a titanic battle between humans, aliens, and predators for control of a gigantic ziggurat somewhere in Antarctica. You play first as an intrepid human explorer who must rescue his companions from their cruel fate as hosts to alien young. Secondly, you inhabit an alien's chitin as it roams the pyramid impregnating humans and growing into maturity. You spend the final sequence as a predator warrior hell-bent on ridding your sacred temple of human and insectoid vermin. 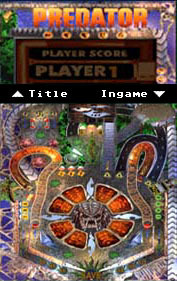 Each of these chapters features five playable levels, which are filled with ladders, platforms, power-ups, and plenty of the other two races to kill or avoid as necessary. The levels advance when you reach a certain race-dependent goal... rescued comrades for humans, deposited young for aliens, and skulls collected for predators, respectively. Predator: Concrete Jungle unfolds the gripping tale of the alien's history on Earth between two separate time periods, 1930 and 2030, as the Predator embarks on a mission of revenge upon a Mafia organization and its leader who seek to expose its very existence. City environments of the 'concrete jungle' are the perfect hunting grounds for the Predator, and the original story ties into established Predator mythology including back story about the origins of the Weyland-Yutani empire. Taking inspiration from the popular film franchise, the game allows players to roam a vast city landscape while stalking human prey with weapons of annihilation, cloaking technology, and various vision modes. Experience the hunt from the perspective of the Predator - kill at will or hunt with honor - using an arsenal of quintessential Predator weapons such as wristblades, plasmacaster, combistick, speargun and smart disk. The highly responsive combat system enables the Predator to stylize its attack moves for different prey, with four different vision modes to enhance the hunting experience: Thermal Scan, Neural Scan, Prey Scan, and Tech Scan. Aliens vs. 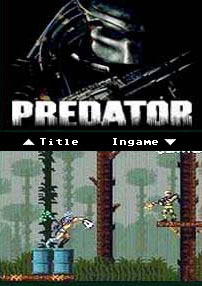 Predator is an entirely new title for PC and high-definition consoles from acclaimed British developer Rebellion, the team behind the 1999 original PC gaming classic. Bringing the legendary war between two of science-fiction's most popular characters to FPS fans, AvP delivers three outstanding single player campaigns and provides untold hours of unique 3-way multiplayer gaming. Experience distinctly new and thrilling first person gameplay as you survive, hunt and prey in the deadly jungles and swamps surrounding the damned colony of Freya's Prospect. As the Marine, you'll experience a claustrophobic and terrifying experience where light is your friend, but there's never enough. However, the United States Marine Corps are humanity's last line of defence, and as such they are armed to the teeth with the very latest in high explosive and automatic weaponry. And the most deadly species in the universe, the Alien, offers you the chance to play as the very stuff of nightmares - the monster in the dark swarming forward with countless others, jaws like a steel trap and claws like blades. Or play all sides off against each other in a series of unique 3-way online modes and go tooth-to-claw-to-pulse rifle in the reinvention of one of multiplayer gaming's defining moments.